I've heard several ideas, Mr. AA0........flat rides, a wild mouse - an old favorite - renaming the entire area after changes are made, etc. Will be interesting to see what develops. I think it will be a winged coaster. They should call it Son Of Bat or Bat Legacy and re-theme the area to be spooky. Sounds cool, Mr. Roberts. I've been hearing lots of different rumors from people but haven't a clue. What is on the sign? You think it will be a winged coaster? That isn't a bad idea actually, the teaser can line up to the Bat idea to return to Kings Island. 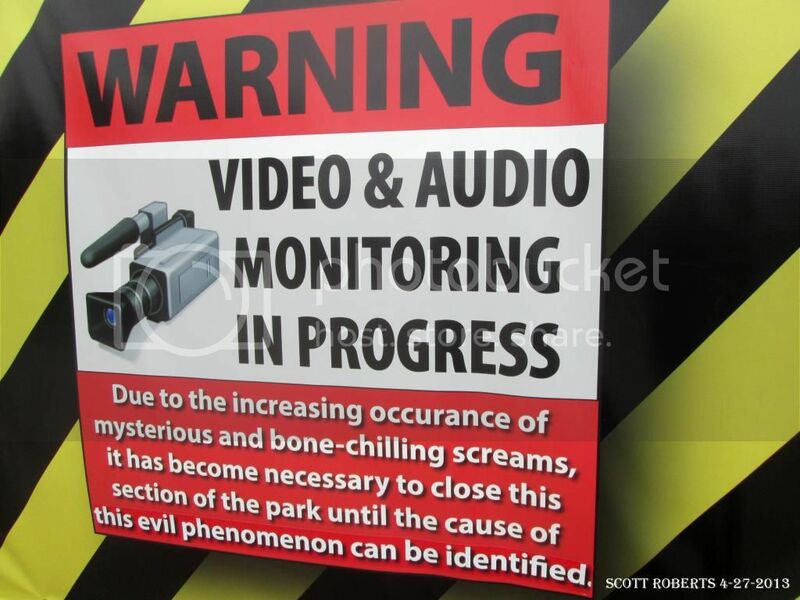 The sign says something to the effect of cameras and sound recording devices in place due to sounds of screaming from the woods. I think it will be a winged coaster because Cedar Point just got one and Cedar Fair has been getting multiples of each rides for their different parks. Just like multiple parks got Windseekers and once Kings Island got Diamondback then Carowinds got Intimidator and Canada's Wonderland got Leviathan, which all three are like different models of the same make. The re-theme-ing the area to be spooky is just my wishful thinking. Would be kinda nice to have the theming you mentioned, Mr. Roberts. But as we all know, their signs are usually misleading as to what is to come.......remember the Mustang stuff regarding what is Diamondback? There is a lot of room to fill in that area. By the way, I hear Windseeker is still not operating........wonder how long it will last. My guess is that it will re-open when the weather cooperates. But it is only a guess. I haven't heard any rumors or anything. Actually, looking at the yellow and black stripes on these signs, aren't they the same that were used when Son Of Beast was being built? I guess the yellow and black stripes are just a wall paper type of background behind the signs. Still, the bit about monitoring because of screams seems awfully familiar. "ignore the screaming....in the woods.."
Ignore the screming....in the dirt plain, it may possibly be a banshee. Everything is questionable sadly, but the best bet is right now on the Banshee name. I just hope it is not a clone of GK. I would love to see an Abbott and Costello Meet The Beast ride! I think they just put a new strip on the bottom with different wording, Mr. Roberts. If you look you can see the red is brighter and there's a definite line...........and wouldn't Abbott and Costello/Beast be terrific? Upon closer inspection, including checking out other people's photos, the sign, shadow behind it and stripes all seemed to be printed on one big banner. The shadow creates an illusion that it is layered, sign over striped background, but it is actually just printed to look that way. As stated in a interview with Mr. Ouimet, there will be no other winged coaster at any other Cedar Fair park. This is actually a shock to me, I thought this was the next to be cloned, I like how he is now making key rides that are now found only at one park. Well, that's all that I had. I'm still betting on either a coaster or flume, going by the footers, but I guess we'll have to wait until its officially announced to find out for sure. Any possibility of a water coaster, I wonder, Mr. Roberts? You're right, judging by the footers, it has to be something fairly big. Can't think of anything else it might become at this point. I just read last night that The Beach has a water coaster called the Big Kahuna. It was originally called Aztec Adventure. I never knew they had such a thing but I'm betting its more of a flume (gravity driven) than a true coaster where you go up and down hills, Like Holiday World has got. It is more of a flume, Mr. Roberts. I would never call it a coaster, not remotely like the one at Holiday World. If I remember correctly, when I was there once for their winter thing it had water frozen on it and they were using it for sledding.......not that tall or big at all but a nice size for the Beach area. I feel like a B&M invert is certainly plausible as well as a B&M giga, although I understand why many would say a giga is very unlikely since their previous coaster installation, Diamondback, is essentially the stepped-down version of a giga. You may be right, Mr. DumaKey1212. Hard to tell anything; construction seems to have slowly greatly over the last week or so. The view of the construction area from the Eiffel Tower. This is taken 5.21 (today). More pictures can be found below. It looks like the only place there is any construction going on is where the midget cars used to set. Nothing going on back in the Son Of Beast area. This could turn out to be something much smaller than a coaster. Nice pics, Mr. DumaKey1212. I think they let the space in the fence open on purpose. Makes for good ground shots. And Mr. Roberts, you may be right. Might turn out to be completely different from what people expect.